Congratulations to you and thank you to all who entered. Winners please contact us to receive your prize! Laboring under an Illusion explores the way in which birth attitudes and expectations are shaped largely through exposure to mainstream media depictions of childbirth. 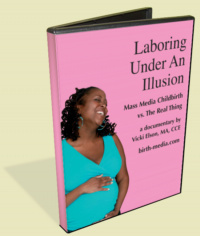 Filmmaker Vicki Elson, anthropologist and childbirth educator, has created a striking documentary contrasting media portrayals of childbirth with real clips and commentary on actual births. As an educator, I frequently reference how preconceived ideas and birth beliefs subconsciously help or hinder how a birth will progress. The film eloquently provides 50 minutes of supporting material to illustrate that exact point. I previewed the film alone and then watched it again with my two daughters, ages 7 and 5. As each set of clips were shown, my daughters would shout "fake" at each media-generated depiction of birth, clearly rejecting the concept that birth must progress like it does in the movies. Because of some strong language in the media clips, I recommend previewing it first before deciding to share it with your children. The film contrasts media-generated portrayals of childbirth from well-known sitcoms such as I Love Lucy, Murphy Brown, Mad About You, Northern Exposure, and Friends, movie clips such as Juno, Coneheads, Knocked Up and Nine Months, as well as more "reality-based" clips from Discovery Health to actual clips of births from films such as Birth as We Know It, The Business of Being Born, and Orgasmic Birth. 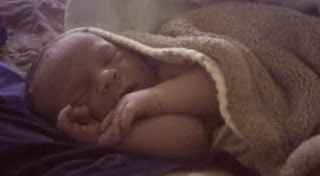 At some points in the film, the filmmaker highlights issues raised in the film, such as the fact that some media portrayals are so far-removed from birth reality that babies are born minus umbilical cords. It also contains brief narration from mothers about birth. For the birth-junkie viewer, this additional explanation isn't critical, but it's quite useful for less birth-savvy viewers or use in childbirth education classes. According to the Centers for Disease Control and Prevention, approximately one in every 33 babies is born with a birth defect. A disturbing number of these are caused by the use of dangerous medications during pregnancy, and many can be prevented through greater awareness and safer practices. Throughout the history of modern medicine, a number of popular medications have been linked to serious birth defects and fetal death after they have been on the market for quite some time. Some of the most widely prescribed include thalidomide, a medication used during the mid 1900s as a sedative and antiemetic agent, and Accutane, a medication used since the 1980s to treat severe acne. Clinical studies have shown that even a single dose of these medications taken during pregnancy can result in birth defects. Many women who have suffered because of these medications have sought legal recourse against drug manufacturers through the use of a Thalidomide or Accutane lawyer. Consumer advocates have argued that in a number of instances, negligent drug companies have hidden or downplayed serious risks posed to pregnant women by their medications. Even as efforts to protect pregnant women against such dangerous medications have grown, many measures taken by drug companies and the U.S. Food and Drug Administration (FDA) have fallen short. In the case of Accutane, even after the FDA required women taking the medication to use two forms of birth control and enroll in a mandatory registry, approximately 120 enrolled women reported pregnancies every year. Experts around the nation continue to express astonishment and concern over the amount of dangerous drugs used by many pregnant women today. In today's environment of ubiquitous medication use, health care professionals are instructing women to speak with their doctor before taking any new medication, regardless of whether it is available by prescription or over-the-counter. Because even common pain medications such as Aleve and Aspirin can cause harm to a developing baby, patient advocates are warning women to air on the side of caution for their own safety and the safety of their baby. For more information on drugs that can cause harmful effects during pregnancy, visit DrugWatch.com. Congratulations Heather, I hope CJ's BUTTer comes in handy once your little one arrives in June. Thank you to all who entered. If you didn't win this time around, don't worry, more giveways are coming! We're excited to sponsor another free Spring Giveaway this month! You can even earn extra entries (see How to Enter for full details). 1 lucky winner will receive a free assortment of CJ's BUTTer, a homemade amazing, natural, cloth-friendly diaper rash ointment: a 4 oz jar and 6 additional sampler scents. I cannot recommend this product highly enough!~ My newborn hates (let me reiterate - HATES) diaper changes, but his crying immediately stops when I put on his BUTTer. It is also available in a wide variety of scents - some smell good enough to eat. It's also available in unscented if your child has super-sensitive skin. Leave a comment here on the blog or on our Facebook Fan page. You can earn an extra entry by submitting your natural birth story to our collection. You must include some method to contact you should you win: a link to your Facebook page, website, blog, Blogger profile, email, etc. (Email addresses can be removed from your comments for privacy - only I will have access to them in the event you win - just ask for your email to remain private). The giveaway ends Friday, April 9th. The winner will be contacted via email. If the winner does not respond within 3 days, a new winner will be selected and notified. The winner will be announced on Friday, April 9th both here on the blog and via Facebook. Please bookmark our blog or Fan us on Facebook so you can see if you've won. 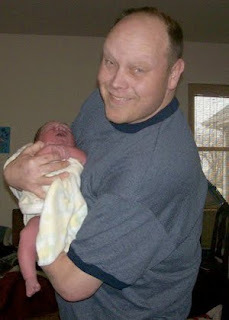 I'm thrilled to announce the arrival of our first son, Oryn Oliver, via unassisted homebirth, on 3-9-10 at 8:23am after about an hour and a half labor. He weighed in at a whopping 9lbs 3oz (at 38 weeks exactly!) and was 20 inches long. 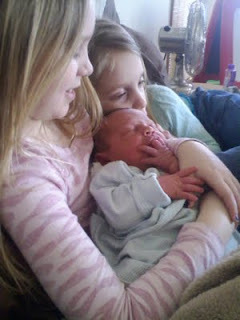 Daddy, big sisters and I are completely in love - he's very, very precious. You've each won a free copy of the new iPhone App, Baby's Here to send out birth announcements via your iPhone. Keep an eye out for an email with further details on redeeming your app. If you didn't win, there will be more giveaways coming up next month, so check back soon. The Baby's Here iPhone app gives you the power to send share your birth announcements through email, Facebook updates, and even Twitter updates with the click of a single button! You must include some method to contact you should you win: a link to your Facebook page, website, blog, Blogger profile, email, etc. (Email addresses can be removed from your comments for privacy - only I will have access to them in the event you win). The giveaway ends Friday, February 26th. The winners will be contacted via email within instructions on redeeming their free copy of the iPhone App. If the winner does not respond within 3 days, a new winner will be selected and notified. The 3 winners will be announced on Friday, February 26th both here on the blog and via Facebook. Please bookmark our blog or Fan us on Facebook so you can return to check for the winners.